Heat oven to 350°F. In 8-inch skillet, heat oil over medium heat. Add mushrooms; cook 3 to 4 minutes, stirring frequently, until tender. Drain if necessary. On ungreased cookie sheet, place bread. Sprinkle 3/4 cup of the cheese on bread. Top with mushrooms and tomatoes. Sprinkle with remaining 1/4 cup cheese. Bake 15 to 20 minutes or until cheese is melted and bread is hot. Sprinkle with basil. Look for focaccia, a flat Italian bread, in the bakery section. Choose a plain focaccia or one flavored with garlic or Parmesan. 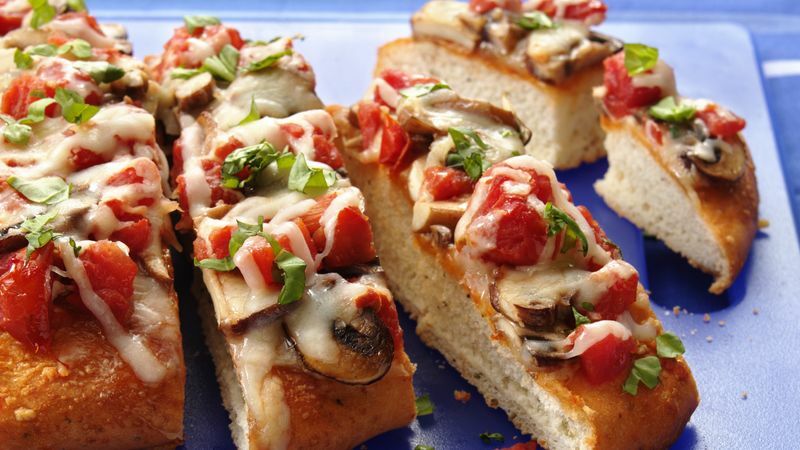 Serve this Italian bread as an appetizer or as a side to a large tossed salad.